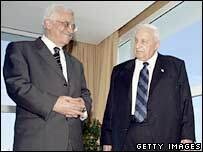 Israeli Prime Minister Ariel Sharon and Palestinian leader Mahmoud Abbas will meet on 11 October, the office of Jordan's King Abdullah II has said. The announcement followed mediation efforts by Jordan to organise a summit to boost the Middle East peace process amid a recent upsurge in violence. A statement from Amman did not say where the talks, which were agreed by telephone, would take place. The summit originally scheduled for 2 October had been put off." Following the good offices of King Abdullah to push forward the peace process, the Palestinian president and the Israeli prime minister will meet to find a solution to pending problems," the statement by King Abdullah's office said. It said that the agreement was reached after the Jordanian monarch held separate telephone calls with Mr Abbas and Mr Sharon. Israel last month cancelled a preparatory meeting for the 2 October summit after rocket attacks by Palestinian militant groups. Israel had also launched air strikes on Gaza despite Palestinian factions declaring they would observe a truce.